Of all the belief systems of Wall Street, few can claim the devoted following of the Efficient Market Hypothesis, the idea that stock prices adhere to the same laws of supply-and-demand that govern retail products. Once coined the theoretical "Parthenon" of economics, this notion has consistently endured the test of time —– until now. Academics and advisors across the globe are currently exposing crack after crack in the "Efficient" model so deep as to bring the entire theory crashing to the ground. "The fact is that everyday in finance, investors are uncertain. So they look to the herd for guidance. 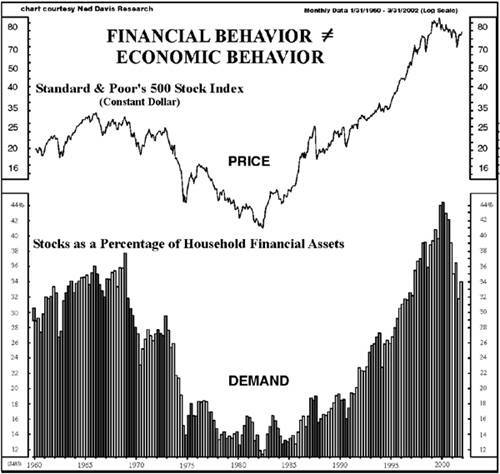 Because herds are ruled by the majority — financial market trends are based on little more than the shared mood of investors — how they feel — which is the province of the emotional areas of the brain (limbic system), not the rational ones (neocortex)… Buyers, in a rising market appear unconsciously to think, ‘The herd must know where the food is. Run with the herd and you will prosper.’ Sellers in a falling market appear to unconsciously think, ‘The herd must know that there’s a lion racing toward us. Run with the herd or you will die.’"
In the end, it’s not enough to just tear down the long-standing EMH. One must build another, more accurate model up in its place. And in the 2004 Theorist, Bob Prechter does just that with the Wave Principle, which reconciles the technical and psychological sides of stock market behavior into this key point: Herding impulses, while not rational, are also NOT random. They unfold in clear and calculable wave patterns as reflected in the price action of financial markets. As the mainstream media continues to jump on board Prechter’s Financial/Economic Dichotomy Theory, you can read both of Prechter’s original writings. Enjoy your complimentary access to the 2004 April 2004 Elliott Wave Theorist and the 2007 Journal of Behavioral Finance. Read some of the latest nuggets directly from Robert Prechter’s desk — FREE. Click here to download a free report packed with recent quotes from Prechter’s Elliott Wave Theorist. This article was syndicated by Elliott Wave International and was originally published under the headline Efficient Market Hypothesis: R.I.P.. EWI is the world’s largest market forecasting firm. Its staff of full-time analysts lead by Chartered Market Technician Robert Prechter provides 24-hour-a-day market analysis to institutional and private investors around the world.